On May 3, students, faculty, staff, alumni and friends gathered in Samford University’s Cooney Hall to celebrate the 40th anniversary of the Gamma Eta Chapter of Sigma Theta Tau International Honor Society of Nursing. Internationally acclaimed oncology nurse and lecturer, Connie Yarbro ‘79 served as the honored speaker for the event. Yarbro is known for pioneering the role of the oncology nurse and she cofounded the Oncology Nursing Society in 1975. She has authored countless oncology publications and has led breast cancer training programs for nurses in 20 countries. In 2017, she was named a Living Legend by the American Academy of Nursing. 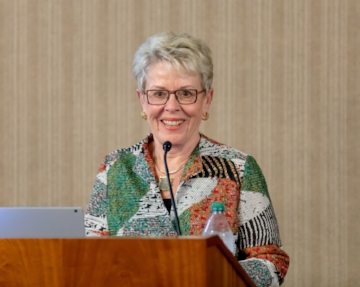 “Connie objectifies the mission and vision of Sigma Theta Tau and I can’t think of anyone more appropriate to serve as our honored guest,” said Nena F. Sanders, vice provost of the College of Health Sciences and Ralph W. Beeson Dean and Professor. “Connie is one of the visionary founders of the Gamma Eta Chapter and her distinguished career has modeled Sigma Theta Tau’s mission to advance world health and celebrate nursing excellence in scholarship, leadership and service,” added Sanders. In her address, Yarbro reflected on her career and the many nurses, patients and families she has worked alongside. She challenged new members to never stop learning and shared wise words for the future. “As you begin your journey, I encourage you to develop and use a professional network. Be creative and think outside the box. Say yes to new roles and don’t forget to say thank you. Most importantly, continue to uphold Ida Moffett’s legacy of compassionate care,” said Yarbro. The ceremony also included the installation of new officers, the induction of 113 new members and the presentation of the Sigma Theta Tau Scholarship. Sigma Theta Tau International includes approximately 530 chapters with more than 135,000 active members in 90 countries. In order to be eligible for induction, nurses must demonstrate excellence in scholarship or exceptional achievements in the nursing profession.